About once every two months, the remaining MSX users from in and around Tokyo gather in Kawasaki city for a friendly chat and to catch up with the latest MSX developments. About two weeks ago, on February the 29th 2004, another meeting took place. This day featured an attempt of a MSX user to measure his collection in meters, a demonstration of the rare Konami MSX game A1 Grand Prix, and the first public introduction of the MSX Game Reader. Although the event space was open from early afternoon, the more interesting events started around 4 o'clock, when Mr. Aoki (alias Mr. Land) rose up to the challenge of measuring the size of his MSX collection in meters! This rather unconvential way of counting software has become popular in MSX circles in Japan ever since a second hand store put its dead stock for sale on the Yahoo auction site (also discussed in this forum thread). It took Mr. Aoki quite some time to unpack his extensive collection. Out his boxes came among other things the complete Wizardry series, originals of Ascii C 1.2, MSX-DOS 2 tools, SBUG2 and many books on programming. Mr. Aoki's collection also comprises quite a few hardly known titles, some of which aren't even indexed on the MSX software database Tagoo and are also lacking from the MSX Association's software collection. One of the surprising aspects of Mr. Aoki's collection was the low number of Konami titles. The owner told me that he also used to collect Famicom titles. 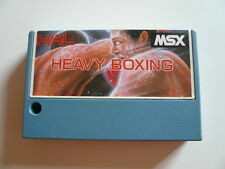 For MSX, he only bought the titles which weren't released on Famicom. Unfortunately for Mr. Aoki, after he moved out of his parental home, his mother decided to clean out the closet. She threw away not only all Famicom titles, but also a substantial number of MSX titles. Titles like Space Manbow were thus entrusted to the local garbage collector. Actually, a lady at the meeting commented that she spotted some MSX software among street garbage as well recently. I myself also share these experiences, so from that point of view, a job as garbage collector in Japan might prove quite attractive for some MSX collectors. After admiring the Aoki collection, the next item on the menu was A1 Grand Prix. First, the proud owner of this game, Mr. Kobayashi, gave a demonstration. On his first attempt, he made it to the last level, which allowed me and the others to get a good impression of the game. Later on, I gave it a try myself, but unfortunately I couldn't get used very well to the manual gear system. I asked Mr. Kobayashi if he could provide me with some details of the game. Most interesting detail is probably the copy protection. A1 Grand Prix could only be obtained as a download from the Links network, a network operative in the 80's in Japan. To connect to this network, a Links modem was required. Each Links modem had an unique product id. Games like A1 Grand Prix register the product id of the modem with which they were initially used, allowing further use only in combination with that particular modem. The game itself consist of two files. The first file contains the data for the Konami logo -two waves and the name 'Konami' in white on a blue background- plus the title screen of the game. It also comprises an option screen in which the player can choose between 'Network game' and 'Training game'. After selecting 'Training game' -the 'Network game' is unusable now that the Links network is gone- the second file is loaded which contains the actual game. Those interested in the game itself are referred to an earlier forum thread. Pictures of the game are available at the Gigamix site at this location. The Southern Kantou MSX users meeting also includes an informal session in which some interesting trends in the present MSX community are discussed. Chairman is Mr. Yokoi of the MSX Association. To enliven the session, Mr. Yokoi brought an official MSX Game Reader with him. This device, which allows you to use MSX cartridge games on a pc, officially isn't shipped to its customers yet. Mr. Yokoi however had gone to the factory to pick one up in order to show at the meeting. As can be seen on the pictures above, internally the Game Reader consists of only one chip. The chip and print reside in a black plastic casing. 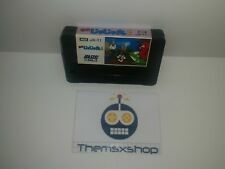 The entrance to the cartridge connector is protected by a black flap, which springs back automatically when the game cartridge is released. After the discussion, about half of the 23 people who visited the meeting set out for a restaurant. The atmosphere was quite lively, and in the end we lost track of time. It was after 11 o'clock at night when we finally left to go home. It was a fun day. I would like to thank Takashi Kobayashi of Gigamix for his cooperation. Many of the pictures accompanying this article were taken by Mr. Kobayashi, but he kindly granted permission to use his material. Kobayashi-san, arigatou.